There are a handful of landmark albums in any genre. In the blues, one of them is Muddy Waters' Folk Singer. Originally released in 1964, Folk Singer was the only acoustic album Waters ever recorded, thus becoming the first and perhaps best blues concept album ever. Now, Folk Singer, which includes fellow blues greats Buddy Guy and Willie Dixon backing up Waters, is being re-released in an expanded version that features two bonus tracks recorded during the two 1964 sessions that followed those for the album - "The Same Thing" and "You Can't Lose What You Never Had". This was engineered by Mal Chisholm with all tube microphones of the day at Chess Studios Chicago. This classic blues album is one of the most remarkable sounding audiophile-quality records of the 20th century. Mal managed to capture a perfectly rich vocal sound on Muddy's voice in a beautiful reverberant field. A must-have album to hear the human male voice. 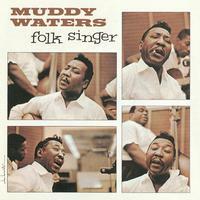 Folk Singer, both the original and this re-release, features many of the songs Muddy made famous early in his career. Recorded in 1963 with Guy on guitar, Dixon on bass and Clifton James on drums, the album spotlights remarkably beautiful updates of songs which first established his place in blues history, such as "My Home Is In The Delta," "Country Boy" and "Long Distance Call," as well as the chain gang song "My Captain." There's also his solo version of "Feel Like Going Home," his first major R&B hit in the late '40s. Muddy Waters was the king of electric Chicago blues, but on Folk Singer he proved to be, simply, one of the greats of 20th century music.